Will it fit? Of course it will. It’s a box of cushions, so it doesn’t weigh as much as it looks it might, but it’s still a huge awkward box. The bakfiets doesn’t care. The only differences between carrying this and other loads is you need a little more room around cars and you can’t see exactly into which potholes the front wheel will land. Otherwise: easy. Especially when you consider if I’d taken the car, I’d have had to have taken out both child seats and folded up the back row in order to fit it in. I was already halfway to FedEx by the time it would’ve taken me to do all that. Three months in and I’ve reached the point at which you feel completely at ease with a new bike. I know how sharply it corners and how long it needs to stop; I know which gear is best for the terrain and I’m in it before I spin out or get caught too high; I can maneuver with the confidence I have on my Raleigh (but the maneuvers aren’t as sharp, clearly). The strange revelation is: I’ve come to understand that it’s a bike. That should be intuitive—obviously it’s a bike—but if you haven’t grown up with this style of riding, the novelty of it can put you off. People ask if it’s difficult to handle, if it feels like it’ll tip at any moment, if hills are impossible, etc. All very good questions! While it certainly takes some time to acclimate to its particulars, the answer really is: no, it’s a bike, just like any other. Who would want a bike that’s difficult to handle? Or one which would tip over while you rode? Why should this be any different? Once you understand that, you just get on it and ride and never think about those things again. P.S. 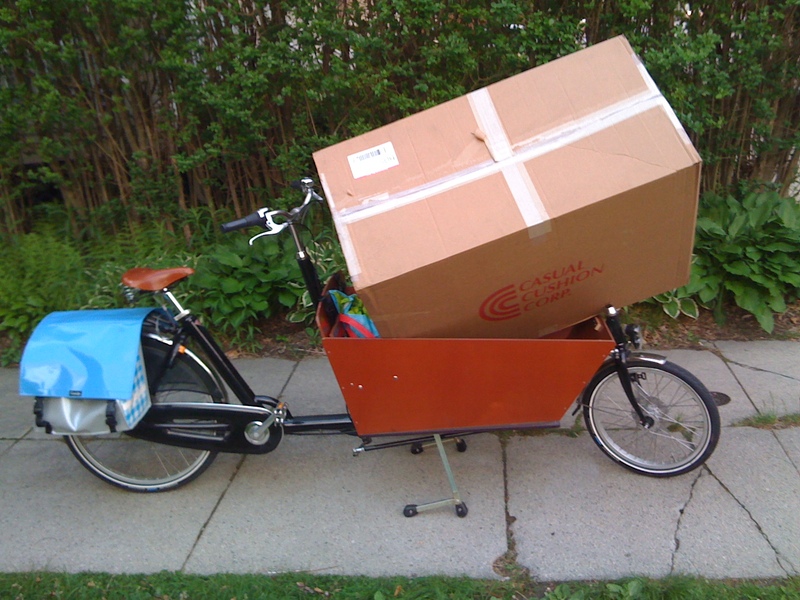 The bakfiets will also make you strong. You really have no choice in that matter. Ride it with your kids and groceries in a moderately hilly city for three months and you will find you’ve added a couple mph to your average speed when you finally get on your road bike for the first time all year. Either that or tire pressure really does make a difference after you get a floor pump with a gauge and discover your tires have been woefully underinflated all these years.